River tubes are an exciting and adrenalin pumping way to descend rivers. These crazy craft have been brought to Morocco from Scotland by Splash Rafting who take over 2000 people in craft like these each year in Scotland. In the Ourika Valley you will be trained by a qualified and experienced instructor prior to getting on the river. 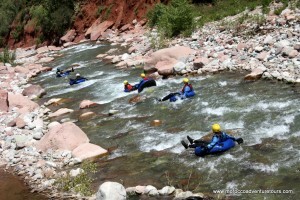 We will then head downstream running a continuous stretch of class 2 and 3 rapids. Tubes are a fantastic way to escape the heat and have a great time while you are at it!! Click on the link to watch a video of us River Bugging in Scotland. We are currently making some films of us doing tubing in Morocco. Included in your day are transfers from and to Marrakech, all equipment and all guide costs. Half day tubes – £50/MAD650pp. For a full day out of adventure you can combine a wild river tube trip with canyoning or rafting. Full day combination of two of the above activities – £90/MAD1200pp. 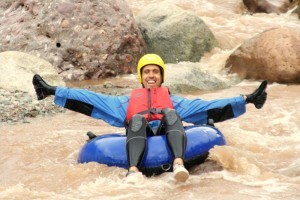 Check out more of our River Tubing pictures at our Photo Gallery.